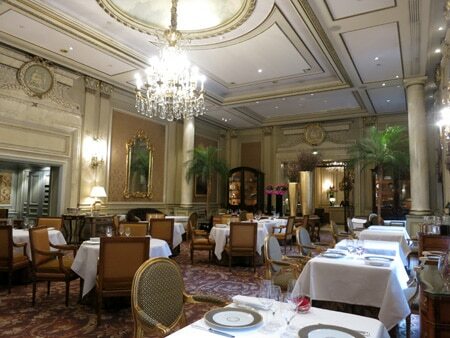 Chef Christian Le Squer sprinkles a palace menu with contained audacity. : A palace restaurant is a quandary. The muffled atmosphere of Le Cinq, its majestic columns, high ceiling, crystal chandeliers, golden armchairs, thick carpeting, 19th century-style paintings topped by delicate cameos encrusted in medallions, and shining silverware set the expected conventional stage for the celebration of the rite of an undivided respect due to a classic. Yes, but, says chef Christian Le Squer, formerly at Ledoyen, with all due respect, let’s modernize the standards without offending the establishment. Keeping the flavors but tweaking the oldies to appear and taste somewhat different is like walking on the razor’s edge. A step too far and both characters are lost. So how does Le Squer fare? Let’s begin with the amuse-bouche --- amusing indeed --- a transparent bubble popping up in the mouth with the scent of an Italian apéritif to be swallowed whole, an aerial sherbet, and on a more familiar tone rests a delicate truffled foie gras tartelette. An original light overture. The basic “soupe gratinée à l’oignon,” the favorite, a tad coarse, preference of the Paris night ramblers, is commonly served steaming in a bowl in the bistros of Les Halles like the famous Pied de Cochon. Here, dubbed “à la parisienne” --- meaning as “usual” --- “contemporary” translates into “modernized,” and it comes under a silver cloche on a flat plate. Onions have been muted thanks to alginates and a dive in a bath of calcium into small gelatinous whitish balls with a liquid heart, topped by a gratin. Picturesque, surprising, for sure, is this foray in molecular cuisine and its spherification. Some may not like the chemical process, but the savor is there, preserved in this new envelope. The sprinkled soft touch of “modernity” wakes up and interrogates our taste buds rather than scaring them. On more familiar and less disputable grounds are the bar (bass) de ligne, poached in fermented milk (Lait Ribot) heightened with Chinese caviar and covered with a foam from which surge two cones of chervil roots, or the “timbale de fruit de mer” (seafood casserole), its basket formed with tiny macaroni au gratin. A pungent lobster shell juice links and enhances the fish (bass, scallop, lobster). Flavors and textures of the pristine products are respected and brought out, as is also what happens to the slightly smoky flavor of the lamb and its Jerusalem artichoke purée and tapenade. Maybe less for the “mousseline” of scallops; it does not add much to the sweet taste of the scallops that is sufficient to make them a natural wonder. But one cannot blame a chef for trying to shoot high. Beyond the sturdy cheese cart crowned by a Saint-Nectaire fermier, the king of all cheeses, desserts relieve us from unhealthy sins, so light and innocuous they appear for our waistline: the croquant (crunchy) grapefruit, the lychees in a snow ball with rosewater also feed our good conscience and help us to close our eyes to the less innocent but notorious dark chocolate and caramel milk dessert inspired by the Carambar taste, an iconic treat for all French children who grew up on it after school hours. There is a large selection of wines by the glass. The wine list has been replaced by a heavy wine book of at least four pounds that keeps track of the 50,000 bottles of the cellar gathered by Éric Beaumard, vice champion sommelier of the world in 1998. The service is as professionally fluid and distinguished as can be. After all, we are in a palace, but it’s the 21st century.